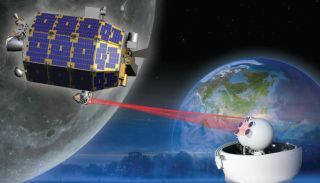 An artist's conception of NASA's moon-bound LADEE spacecraft using lasers to communicate with Earth. Editor's Note: In this weekly series, SPACE.com explores how technology drives space exploration and discovery. Since the dawn of the space age, NASA probes have beamed data home to Earth using radio-frequency communication. But that's all set to change soon. The space agency is working hard to develop laser-based space communications systems, which officials say are key to ensuring rapid and accurate transmission of information from spacecraft around the solar system. LCRD will launch to geosynchronous orbit as a hosted payload on a commercial communications satellite developed by the company Space Systems/Loral. The experiment's two optical modules will use lasers to send information to two ground stations, one in California and one in New Mexico, at rates of up to 1.25 gigabytes per second. LCRD will operate for at least two years, with the aim of demonstrating the long-term viability of a space-based laser communications system. NASA's Lunar Laser Communications Demonstration is a novel test of next-generation communications tech. See how the system works in this SPACE.com infographic. LCRD will leverage technology that has already shown its stuff in space. The mission is based heavily on the Lunar Laser Communications Demonstration experiment, or LLCD, which launched to the moon aboard NASA's Lunar Atmosphere and Dust Environment Explorer spacecraft last month. The LLCD system is also more efficient than the radio-frequency approach employed by LRO and other spacecraft, requiring significantly less mass and power, Edwards added. "So we're really excited about what this means for the future," he said Oct. 23 during a presentation with NASA's Future In-Space Operations working group. The Laser Communications Relay Demonstration (LCRD) will demonstrate and validate a reliable, capable, and cost effective optical communications technology for infusion into operational near earth and deep space systems. NASA officials view LLCD and LCRD as steps toward developing a sort of "high-speed Internet" of space, which would enable probes to transmit data 10 to 100 times faster than they do now. "Just imagine the ability to transmit huge amounts of data that would take days in a matter of minutes," LLCD manager Don Cornwell said in a statement. "We believe laser-based communications is the next paradigm shift in future space communications." Such a capability could allow the streaming of live, high-definition video from faraway planets such as Jupiter and Saturn, officials say. And it would be useful closer to home as well, potentially providing the backbone of NASA's next-generation Tracking and Data Relay Satellite network, or TDRS. TDRS has been helping relay data from NASA spacecraft to the ground since 1983, when the first satellite in the constellation launched to Earth orbit aboard the space shuttle Challenger. Optical communications could give the system a big upgrade, but the technology needs to be vetted by experiments such as LCRD first, Edwards said. "NASA is currently conducting a study as to what future TDRS spacecraft should look like, what features they should have, where they might be located, what the overall architecture [should be], things like that," he said. "One of the things that we're trying to do is make sure we dot all the i's and cross t's with regards to understanding what it would take to put an optical comm service on there." While optical communication offers many advantages, the technology poses some challenges as well. One of these is its cost, which remains relatively high at the moment, Edwards said. "What we're trying to do is to commercialize this to figure out how to drive the cost down," he said. "We have a strategy that we're currently executing that we think will make this affordable in the future." "As you go farther out into deep space, it becomes more problematic," Edwards said. Laser systems designed to work beyond the Earth-moon system would have to considerably larger and more powerful, with bigger ground-based receivers to intercept their beams, he added. To help lay the foundation for such technology, NASA hopes to launch an optical-communications demonstration mission to deep space in the relatively near future. "That work is being undertaken by the Jet Propulsion Laboratory, on something called the Deep Space Optical Terminal," Edwards said. "That's currently in technology development, in concept development. We don't have an actual flight project yet, with a committed funding source and a committed satellite. But we hope to fly something later on in the decade."